C P Odom’s third book with Meryton Press is due to be published in late January 2015. 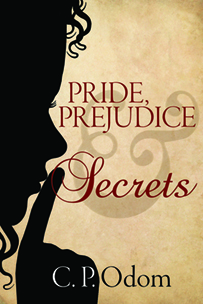 It is always the completely unforeseen events that lead to the most unexpected consequences, and such is the case in this variation on Jane Austen’s Pride and Prejudice. One of the crucial points in Austen’s novel is Miss Elizabeth Bennet’s fiery and passionate refusal and denunciation of the equally passionate but infinitely more repressed Fitzwilliam Darcy. What might eventuate if the robustly healthy Elizabeth falls prey to illness for almost the first time in her life just when Darcy comes to call? Bemused by her illness, she hardly comprehends what Darcy is asking, and her simple nod of acknowledgment is misinterpreted as acceptance of his suit by a joyous Darcy. By the time Elizabeth regains her health, it seems that every one of her acquaintance and many outside of it accept that she has become engaged to the last man in the world she would ever have considered marrying. Can she openly demand her engagement to the amorous but prideful Darcy be broken, a course fraught with hazards in the social milieu of Regency England? In a maelstrom of confusion, choices have to be made and disclosures closely considered. Elizabeth knows that nothing in her life will ever be the same, and the consequences will likely spread further than she can imagine. Fitzwilliam Darcy stretched his long legs toward the fire, grateful for the warmth on his slipper-shod feet, and took a sip of his brandy, luxuriating in the warmth that spread from his stomach. But he stoutly resisted the desire to take another sip because the last thing he needed tonight was to impair his thinking processes with an excess of drink. He had a decision to make, one with which he had struggled during the entirety of his visit to the home of his aunt Lady Catherine de Bourgh. It was a momentous decision, the most important of his life to date, and one that brought him into emotional conflict with his own character. He was proud of his ability to control his emotions, to refrain from impulsive and illogical reactions, and he was equally proud of the honour and prestige of his family. Yet these parts of his character were at war with just that part of him which he had previously imagined fully under control—his passions and desires. For many days he had struggled with what his logic said he ought to do against what the emotional part of him wanted very badly to do, and he was finding the contest more contentious than it ought to be. He was, in point of fact, one very confused young man on this cool April evening, and he raked his fingers through his dark hair in the extremity of his agitation, unconscious of this mannerism and what it might reveal of his inner turmoil to those who knew him well. One of those who knew him best sat with him tonight in his room at Rosings, sharing a late night libation before retiring. Darcy glanced up to see the penetrating eyes of his cousin upon him, and he was uncomfortably aware that those eyes were all too familiar with him, his mannerisms, and even much of his inner nature. But Colonel Richard Fitzwilliam, who was his cousin by accident of birth and a close friend by years of association and affection, said nothing, glancing away to look down at his brandy snifter as he warmed the glass between his hands. Satisfied with his efforts, Richard raised his nearly empty glass and drained it, closing his eyes in appreciation for several leisurely seconds. Then he gave a prodigious yawn, stretching his long arms and arching his back before putting down the glass and standing. “I believe I am now ready to seek my bed, Darce,” he said, studiously not commenting on his cousin’s discomfiture. He knew Darcy was struggling with some dilemma, and he was mightily curious as to the nature of what troubled his usually imperturbable cousin. While he had certain suspicions in that direction, he found it hard to give them credence since they conflicted so greatly with Darcy’s usual nature. But, despite his interest, he had not been asked for advice, and he was far too polite to intrude uninvited into his cousin’s affairs except under circumstances more dire than this appeared to be. Darcy nodded, forcing his voice to casualness. “Yes, we leave early Saturday morning.” He had not previously explained why he had twice delayed their departure, and he did not do so now. But he could not delay his departure further as he knew his cousin Fitzwilliam did indeed need to return to his duties. Richard was a younger son, and his employment as a colonel of cavalry was required, even though his pay was not sufficient for the expenses of a young man of his standing. His father, the Earl of Matlock, provided an allowance to help make up the difference, but there were still times, such as the present, when Richard found it quite difficult to meet his obligations. His pay was predicated on the number of men available for muster, and the regiment was depleted from losses suffered in the Peninsular War in Spain and Portugal. Thus he was anxious about returning to his regiment to see to the training of the new troopers needed to bring his unit back up to strength—and to restore his finances to their former level. “Good. Well, g’night, Darce.” The door closed behind Fitzwilliam, leaving his cousin alone with his thoughts. Well, at least one of us is retiring, Darcy thought, settling lower into his chair and again stretching his feet out to the warmth of the fire. He was uncomfortably aware that he was exceedingly unlikely to find the solace of his own bed any time soon, and he again wondered whether he should have asked Richard for his advice. No, he thought, my own mind is too confused. How can I ask Richard if I should marry Elizabeth Bennet when I cannot determine whether I am being true to my heart or am hazarding the very name and honour of my family? It is a certainty that such a match would not be an advantageous one. Both of my parents would be aghast at the mere thought, were they still alive. When he thought back to the previous autumn, when the two of them first met while he was visiting his friend Charles Bingley in Hertfordshire, it was still difficult for him to understand just how he had arrived at his present quandary. Nothing could have been less propitious than their first meeting at the Meryton assembly when he coolly evaluated her beauty as “tolerable, but not handsome enough to tempt me” and flatly rejected Bingley’s suggestion that he dance with her. He had, at the time, given little thought as to whether this thoughtless remark might or might not have been overheard, for he cared little for any of the inhabitants in the neighbourhood. Now, as he thought back to that night with mortification, he could only hope she had not heard him. But somehow, without really understanding how it happened, his attitude toward at least one of the neighbourhood inhabitants gradually changed. While his friend looked upon Jane Bennet, Elizabeth’s older sister, with obvious admiration, Darcy initially observed the younger sister only to find points to criticize. But by some twist of fate, hardly had he made his opinion clear to his friends than he began to regard her differently. First, he was struck by the manner in which the beautiful expression in her dark eyes rendered her face uncommonly intelligent. And he scarcely had time to recover from that inner discomfiture before other observations began to intrude on his notice and disturb his composure. The first was his increased appreciation of the grace of her form. He had earlier found little symmetry in her figure, but subsequent encounters at social events caused him to change his mind. After further consideration, he came to the conclusion that her shape could be more accurately described—at least by him—as light and pleasing. And her carriage, which he first deemed to be unremarkable, later drew his eye due to its supple grace and liveliness. And his early criticism of her manners, as not being those of the fashionable world to which he was accustomed, was later overcome when he found himself attracted to her easy, playful demeanour. But his growing attraction, as he met Miss Elizabeth Bennet at other social events and even danced with her at Bingley’s ball at Netherfield, had foundered on the rocks of what was expected of a gentleman from a family such as his own when choosing a wife. He tried to resist the growing attachment he felt for this free-spirited young lady; the selection of a suitable wife was not to be made hastily or be based on an “attraction.” Instead, as his parents had stressed, he should carefully choose a young lady from his own social class, a young lady from a good family who could bring either enhanced fortune or connections in their society to the match. And Elizabeth Bennet, despite being the daughter of a gentleman landowner, came from an undistinguished family, and her father’s estate was so modest that he had not settled anything like a suitable dowry on his daughters. So Darcy had left Hertfordshire in company with Charles Bingley, whose own romance with Elizabeth’s sister had run aground due to that sister’s serene detachment and indifference. But, while his friend’s pain had been openly expressed, Darcy had camouflaged his distress by means of rigid self-control. He was certain no one, not even Elizabeth Bennet, ever suspected how close he had come to violating the teachings of his parents and his class by seeking a closer connection to this most bewitching young lady. He knew such a move on his part would have led inevitably and inexorably to an offer of marriage on his part. Luckily, or so he thought at the time, he fled before he completely lost control of his life. He subsequently managed, over the months since that time in November, to settle his nerves and regain his composure, and he became certain, absolutely certain, that he had managed to lay his transitory attraction to rest. That delusional attraction would distress him no further since he would not return to Hertfordshire and would never see the alluring Miss Elizabeth Bennet again. Then he and his cousin arrived a little over two weeks previously for their yearly visit to their aunt, who was the sister of both Darcy’s mother and Fitzwilliam’s father, only to find that self-same Elizabeth Bennet in residence in the home of his aunt’s parson, who was both her cousin and who had married her close friend Charlotte! The stunning impact when he beheld her graceful form and expressive face on his first visit to the Parsonage or later when he met her during her daily walks had shattered his carefully constructed composure, leaving it in such utter ruin that he found himself more strongly attracted to her than had been the case the previous autumn. Of course, he could not avoid her company when she joined her cousin and his wife for dinner or tea at Rosings, which occurred regularly due to the invitation of his aunt; she seemed to be amused by the forthrightness and unpredictability of Miss Bennet. But he absolutely knew he should stay away from the Parsonage. He especially should not seek her out when she walked. And he found it impossible to do either. He was drawn to the orbit of Elizabeth Bennet as a moth is drawn to a flame—and with the same possibility of doom if the hot flame should ignite a fire that could not be controlled. What would Mother say? Darcy squirmed in his seat in agitation at the thought. She always warned me against allowing myself to be ensnared by feminine attractions or allurements, and now I have done exactly that. I am bewitched, absolutely enthralled, yet my family and friends will be shocked beyond measure if I offer marriage to this lovely and charming, though otherwise rather unremarkable, young lady, even if she is gently born. But I am possibly more terrified by the thought of not acceding to my desires! How barren will my life be if I again flee without making my wishes known? Elizabeth almost certainly was not aware of my fascination last autumn, but she must be aware of them now. How could she not? My actions could have no other explanation than affection on my part, and the manner in which she has jousted with me shows her awareness. If I leave again, she will know I am too terrified of the conventions, of the strictures of my class, and she will have no choice but to close the door on that chapter in her life. Likely she will be sorely afflicted, and her pride is such that she could never again allow herself to be attracted—or hurt—by anything I might do. It was this final thought that solidified his aspirations, almost like a puzzle assembling itself, and he was astonished at the manner in which his mind cleared and his hopes became fixed, all in a manner unprecedented to his experience. I cannot live without her. He comprehended that simple thought with complete and utter certainty, even as consternation mixed with elation filled him. How can I turn my back on the woman who is the other part of my soul? How can I live with myself if I capitulate and settle for some vain, supercilious society lady, such as — God forbid — Charles’s sister, Caroline? Every day would be as empty as a desert! I shall have none of it! He jumped to his feet and began to stride back and forth in his chamber, thinking, considering, and formulating. He knew his aunt had invited the party from the Parsonage to take tea at Rosings tomorrow afternoon. That would be an appropriate time. He could quietly suggest a stroll in the gardens to Elizabeth, who would be expecting something of the sort since she knew of his intended departure on Saturday. Yes, that’s the way I shall handle it, he thought. Then all this discord and anxiety can be laid to rest. I want her to meet Georgiana as soon as she returns to London. She is supposed to stay another fortnight with Mrs. Collins, but that will change after our engagement is announced. And I want to show her Pemberley as soon as the wedding can be accomplished. She may have rambled in Hertfordshire and Rosings, but the walks at Pemberley are quite another matter! And Darcy’s cheeks flushed as another thought came unbidden to his mind, the thought of the first night of their marriage, of his knock on her door, of Elizabeth turning toward him, clad in her chemise, with a smile just for him. Elizabeth Bennet stifled a groan as she opened her eyes to the early morning light filtering through the window at the Hunsford Parsonage. Her head hurt! The pain was like something pounding on her forehead from the inside, and the light itself seemed to pierce her eyes painfully. She felt feverish and light-headed, and her throat hurt when she tried to swallow. During her twenty years, Elizabeth had rarely been sick, and her few illnesses had been minor. Thus, she had simply indulged her active nature and ignored such trifling ailments; she refused to let them alter or diminish her normal routine. So it was not unexpected that she would drag herself out of bed and begin to dress as she would have for any other day. Dressing took more time than usual because her head hurt so dreadfully, but eventually she completed the task and left her room. It was a measure of her discomfiture that she held tightly to the rail as she descended the stairs, but between her determination and her illness, she refused to give in to her suffering. Though she was not hungry — unusual in itself — she did have a raging thirst and desperately wanted a cool drink. When she finally negotiated the stairs, she was pleased to find the breakfast room deserted except for Charlotte. But, if Elizabeth was successful in deceiving herself, Charlotte was under no similar inhibition, and her smile vanished with her first glimpse of her friend. She instantly hastened to assist Elizabeth to the table, and a quick touch to Elizabeth’s forehead confirmed her suspicions as she looked at her friend in concern. “I shall order lemonade brought up from the cellar immediately.” Charlotte swiftly left the room, well aware it would do no good to argue the point with her friend because of Elizabeth’s occasional bouts of stubbornness. She wrote a quick note to her husband informing him of his cousin’s illness and sent it to Rosings, where he waited upon his patron, Lady Catherine de Bourgh. Darcy sat silently at the breakfast table, doing his best to ignore the discordant conversation of his Aunt Catherine as she advised her parson in the details of the sermon he should deliver on Sunday. Though he held Collins in rather low esteem, he still felt a degree of sympathy for the hapless man who listened in subservient attention to his patroness as she delivered her opinions in great detail. Darcy disliked seeing any living being, even an inconsequential creature like Collins, debased in the manner her ladyship delighted to characterize as “frankness.” He had been the subject of her discourses on more than one occasion, especially regarding her delusion that he and her daughter, Anne, would one day wed. It was nonsense, of course, and both he and Anne were of one mind on the matter. Anne’s frailty and persistent illnesses made such a marriage impossible, even had they been so inclined, which was not the case. He had endured those harangues in his usual manner, keeping silent and waiting for the ordeal to end rather than stalking out of the room in cold contempt, reminding himself sternly that Lady Catherine was his mother’s sister. He knew the two had been very close, despite having such different temperaments, and he studiously endeavoured to avoid such a direct and potentially disastrous confrontation with his aunt. He envied his cousin Fitzwilliam’s more cavalier attitude towards Aunt Catherine. While he accompanied Darcy on these yearly visits to Rosings when he was able, his reasons were due more to his affection for his cousin than to his attachment to his aunt. He was unrepentant in the way he took every opportunity to leave the table early and avoid these monologues, and he had done exactly that this morning, silently rising and departing the breakfast parlour ten minutes earlier while his aunt’s attention was diverted. Darcy always marvelled at how stealthily Fitzwilliam could move when he so endeavoured. Somehow, his chair did not scrape as he rose, and his hard-heeled boots made no sound on the wooden floors. It was always astonishing to watch him simply fade away, and Darcy wished he could do likewise. However, not even his aunt could affect his composure this morning as he sipped his coffee. He felt a vast sense of contentment and a complete absence of the anxieties that had plagued him since he arrived and discovered the presence of Elizabeth Bennet. Neither his lack of sleep nor the strain of wrestling with unresolved dilemmas could bother him any longer. Despite pacing the floor until well into morning, it was done, matters were decided, and he could move ahead with the rest of his life in a manner that would solidify his future happiness. Of course, he still had to manage his actual proposal, but he knew that the most difficult part — making up his own mind — was complete, and he anticipated few problems this afternoon. She certainly would be expecting his addresses before he departed Rosings, and this afternoon’s invitation to tea would clearly be the most likely occasion to seek a few moments alone with her. A quick suggestion of a stroll through the garden, a few moments alone in a secluded alcove, and it would be done. But not completely done—there would be other problems to be confronted. Foremost would be the impact on his family. He was well aware that his decision to marry a completely unknown young lady with no connections and no fortune would upset or possibly even anger a number of his relatives. Even greater was Aunt Catherine’s outright delusion regarding Anne and he. At some time before his mother’s untimely death, the two sisters had thought it a good idea to match their offspring in marriage, a joining that would have combined Rosings with the Darcy estate of Pemberley. Or, at least, that was what her ladyship had so often intimated, and he did his best to ignore those repeated insinuations that he, somehow and without being consulted, had become engaged to Anne. The fact, which he had often tactfully stated, that nothing of the kind had ever been considered by either him or Anne was simply ignored. He now wished he chosen confrontation rather than avoidance, and he would have to pay the price for that reluctance once he announced his engagement. Given her usual lack of restraint in expressing her desires, she would undoubtedly be quite effusive in her objections, but Darcy’s mind was made up. The fact that his decision owed more to his heart than to his head did not change his determination, and he and Miss Elizabeth Bennet would marry. Such a match might also upset her brother and his uncle, Lord Matlock, who had expressed an opinion similar to what Darcy knew his parents would have offered: that Darcy should select a wife who would enhance either the Darcy family name or fortune — preferably both. Neither of these objectives would be met by a connection to the unknown Bennet family, whose small estate in Hertfordshire was quite modest in size and income and, in any event, was entailed away to the nearest male relative. That the male relative in question was the foolish and deferential Mr. Collins, his aunt’s parson and his future wife’s cousin, was yet another unlikely coincidence in this whole unlikely tale. It might even upset Richard, who had certainly been attentive to Miss Bennet since that first introduction. Darcy had the uncomfortable feeling that Richard’s attentions might have been even more marked if he had not been the third Matlock son and thus wholly dependent on his allowance from his father to supplement his meagre Army income. He had often jested to Darcy that he needed to pay at least some attention to money when he married, and thus his gallantries to Elizabeth had not been marked by the kind of intensity that would have indicated a true desire for a permanent connection. Still, Darcy had not enjoyed how easily Richard could converse and laugh with the young lady, who often left him tongue-tied. Darcy’s thoughts were so consuming that he did not notice the arrival of a message until the housemaid spoke, having waited for a break in Lady Catherine’s lecture. “A message for Mr. Collins from the Parsonage, your ladyship,” the maid said. Darcy, his concentration broken, frowned in displeasure at the way his aunt snatched the folded paper from the extended platter. She quickly tore open and read the message, then dismissively handed it to Mr. Collins. Darcy knew Mrs. Collins was perfectly capable of handling such matters without the aid of her husband, but that man desired to be included in such matters because he fancied himself as the master of his household. However, he was alarmed to hear of Miss Bennet’s illness, and he also knew Mrs. Collins was too level-headed to mention an apothecary without sufficient reason. An illness might be an impediment to his plans, but more worrisome was his fear for Elizabeth, for he was well aware that disease was responsible for far too many early deaths in their society. Lady Catherine evidently had exhausted the subject of Sunday’s sermon, and she dismissed the parson with a flick of her hand. Mr. Collins bowed repeatedly as he backed toward the door. Meanwhile, Darcy finally took a page from his cousin Fitzwilliam’s book and silently retired from the table and left the room while his aunt was dismissing her parson. So silent was his withdrawal that Lady Catherine noticed nothing and only felt confusion at suddenly finding him gone. As he hurried to the Parsonage, he was anxious to see Miss Bennet himself and make his own judgement of the severity of her illness. He even wondered whether he might find an opportunity for a few minutes alone with her to make his addresses since it seemed unlikely she would come to tea that afternoon. “Miss Bennet, please,” Darcy said as a maid opened the door. He was not even conscious of the strange look she gave him since he had been careful on his previous visits to ask for either Mrs. Collins or simply ‘the ladies’ in order to give no marked distinction to Miss Bennet. Now, with this simple statement born of his worry, he was completely unaware of how much of his inner feelings he revealed to the unknown servant. He was equally unmindful as the maid opened the door and said, “Mr. Darcy to see Miss Bennet,” nor did he notice the glances this announcement occasioned from Mr. Collins and his wife. They sat at a table with a clearly unwell Elizabeth Bennet. Darcy felt something tighten in his chest at his first sight of Elizabeth. It was always that way recently and had been since soon after he met her in Hertfordshire. It had taken considerable effort over the months to keep that sheer physical impact concealed, but his worry today was such that he did not even try. A single glance confirmed that Elizabeth’s illness was more than a trifling affliction; she was quite pale, and her skin had the slight glistening appearance common to fever. Elizabeth, for her part, hardly noticed Darcy’s arrival, being engaged in an intense conversation with Mrs. Collins, who sat close and held Elizabeth’s hand, clearly urging something on her friend with which she did not agree. This comment about Elizabeth’s hardiness reminded Darcy of the previous autumn when she walked three miles in the rain to Netherfield to look after her sister. She arrived bright-cheeked, windblown, and with muddy petticoats, and Miss Bingley’s comments had been caustic. He, however, thought she showed commendable affection for her sister and did not look at all unattractive, no matter what Caroline Bingley thought. He even went so far as to comment that her fine eyes were not diminished but rather were brightened by the exercise. But he was worried now. The bright spots on her pale cheeks clearly indicated fever, and he knew she needed the attention of a good apothecary or surgeon. He knew better than to depend on anyone his aunt might recommend after years of seeing one useless physician after another parade through his cousin Anne’s chambers without a single clue as to what ailed her. “I shall send for the apothecary immediately, Cousin,” Mr. Collins said, assuming a self-important air as he turned and left the room. Charlotte shrugged uncomfortably, for she regarded Mr. Simmons as a fool masquerading as an idiot, and Darcy instantly divined the reason for her reticence. “But Dr. Palmer…” Charlotte’s protest was weak, overwhelmed by Darcy’s decisive intensity. Darcy was completely unaware of how utterly he was revealing hitherto successfully concealed emotions to a perceptive lady, especially since she had previously wondered whether he might be in love with her friend. But, there being nothing she could do at the moment to confirm her supposition, she did as Darcy asked while he waited with apparent impatience and worry. When the maid arrived, Darcy immediately spoke before Charlotte had a chance to utter a word. So forceful and commanding were these orders that the young woman unthinkingly obeyed, instantly fleeing the room—note and coins in hand—without even a glance at her mistress. Charlotte looked at Darcy in bemusement, all her suspicions and hope confirmed in one brilliant moment. So this is what love looks like! she thought gleefully. Eliza is fortunate to have attracted a man of such significance—who clearly feels so deeply for her! She deliberately rejected any thoughts of being the recipient of such emotions. She had made her choice with full awareness when she accepted Mr. Collins, and she would not repent of it. She long ago put any such regrets firmly into the little compartment in her mind she kept for such unwelcome thoughts and locked it firmly. At the moment, there were matters of real importance to be taken in aid of her friend, who continued to sip her lemonade and show no awareness of the activity around her. Accordingly, she stood up. “I shall give you a few moments with Eliza while I speak to the cook regarding something light for her. If I cannot get her to return to her bed, I hope to at least get some sustenance into her.” With a curtsey, she departed, leaving Darcy alone with Elizabeth. Despite not showing any visible awareness, Elizabeth had watched most of these transactions with detached bemusement. Everything about her had a dreamlike quality, a curtain of unreality that submerged her usual antipathy toward the tall, handsome man who stared at her so intently. Thus, Darcy was surprised to hear Elizabeth speak in what appeared to be a lucid manner. “Ummm, that is…” Darcy was suddenly at a loss for words after his previously decisive orders. Elizabeth only waited quietly, and he finally gained control of himself. Darcy winced at this reminder of his frequent losses when verbally jousting with Elizabeth, but it was clear that, if her light-headedness had affected any of her, it had not affected her memory or her spirit. The room appeared to be resuming its spinning motion, though more slowly; however, she wished to hear what Darcy had to say. She hoped that it might refer to Mr. Bingley’s sudden departure from Hertfordshire or perhaps his presence in town. She could think of nothing else that might occasion a private interview. Darcy was struck dumb as he looked down at the pale girl who sat and sipped her lemonade. Despite the flush on her cheeks and the slight sheen of perspiration on her forehead, he thought she looked even more beautiful and desirable than when she was not ill. Perhaps it was the fact that she needed assistance, when she was normally so self-reliant. “Sir?” she said again, more faintly this time, and it was perhaps this clear evidence of illness that caused Darcy to fall to one knee before her chair and take her feverish hand in his own. Elizabeth was disconcerted by Darcy taking her hand, especially since neither wore gloves, but she did not protest the undue familiarity. She simply felt too weak and distracted. Darcy considered how to ask his question, but he decided that Elizabeth’s illness precluded any other explanatory items. So, in light of her understanding of his intentions, his words were simple. In her defence, Elizabeth later wondered whether she had been hallucinating, weaving the conscious events with her unconscious thoughts, imagining that the man offering marriage was one of those who occasionally populated her dreams. In her lightheaded state, she nodded politely—a common occurrence in her dreams—but Darcy’s response caught her by surprise. His eyes darkened and seemed to stare into her soul, and then he leaned forward and kissed her fingers tenderly. “Thank you, Elizabeth.” His words were low and husky, and even in her illness, Elizabeth suddenly recognized the implications of his use of her Christian name. As she was galvanized to struggle against her surreal state and comprehend what had just occurred, the door opened as Charlotte returned to the room. Darcy realized instantly that she must have been waiting outside the door and likely listened to the conversation. Elizabeth, of course, did not have a similar realization until some days later, and she had not even started to realize the necessity of informing this man that he had jumped to an unwarranted conclusion before Charlotte returned to find Darcy standing by Elizabeth’s side and holding her hand in a manner that was unmistakably indicative of solicitousness—and assurance. “That is wonderful news, Mr. Darcy.” Charlotte’s response was enthusiastic, and she had to smile as Darcy beamed, looking down at Elizabeth proudly, still maintaining his grip on her hand. She had never seen him exhibit such unrestrained cheer, and there was no trace of his normally reserved demeanour. His voice was unusually light and merry, matching his countenance, as he expressed himself as warmly as a man violently in love ought to do. Charlotte glanced at her friend, who still looked rather confused, and she recognized that Elizabeth had no comprehension of the heartfelt delight upon Darcy’s visage. She was sorry that Elizabeth was missing the insight into this more than slightly inscrutable man she had just agreed to marry, but she felt certain her friend would have sufficient opportunity in the future to realize such matters. At the present, it was clear that Elizabeth was light-headed and completely oblivious to all that was happening. But Charlotte did not care; sometimes it was necessary to take care of one’s friends for their own good, and she was overjoyed at Eliza’s good fortune. She immediately went to her and embraced her warmly, offering her effusive congratulations. Elizabeth’s thoughts at the time were less joyful. What is this? In some confusion, she tried to think clearly despite her dizziness. What have I done? Now, for the first time, she looked up and perceived the significant change in Darcy’s demeanour. Despite her light-headedness, she was stunned at the absence of his usual reserve and distant demeanour. Gone was the stiff, wooden expression that she associated with him. Instead, his face was suffused with obvious joy and warmth, especially when he looked at her. Despite herself, she could not completely resist the gratification of being examined in such a manner. In that state of mixed emotions and befuddled thoughts, she closed her eyes against the bright light and thus was unaware of Darcy leaping to catch her as she swooned. She was equally unaware of being gathered into his arms and carefully carried upstairs, closely attended by Charlotte.